"Long subject to patriarchal control, the female body knows pain and power. 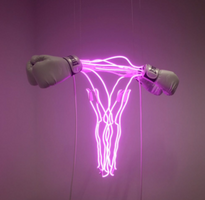 Zoe Buckman invokes this visceral knowledge in Champ, a sculpture of female reproductive organs made with neon light and white boxing gloves. Embellished with materials from bridal gowns and veils, boxing gloves are the central element in Buckman’s series, Let Her Rave, which responds to 19th-century poet John Keats’s expression of male dominance in “Ode to Melancholy.” Buckman’s combination of traditionally feminine materials with boxing gloves is both an assertion of feminist power and an invitation to join the fight. Investigating identity, consumer culture, ecology, history, mythology, and power, the art featured in The Future is Female illuminates both the consequences and the persistence of the struggle for equality: much progress is needed before Saya Woolfalk’s fantasy of a harmonious universe created by her female Empathics reflects lived reality."